What? There is a conspiracy here on the Kryptos puzzle too?! Well, yes. But make no mistake. The Kryptos is legit. It is a real puzzle with real fame and media blitz to award the winner. And there are conspiracies here. Conspiracies to hide the truth. Conspiracies to control information, to divert, to misinform. This is a CIA puzzle with CIA players. It is an homage to tradecaft. The conspiracies here are pure Kryptos. There is much to talk about here. Let me start with an interview Elonka Dunin gave to BellCoreRadio in April. BellCoreRadio is a now defunct hacker/phreaker podcast. The podcast never really caught on, but the did manage to get this Kryptos interview a day after Elonka and Ed Scheidt were interviewed by the New York Times concerning the LAYERTWO problem. When this podcast was first released, the interviewer going by the hacker moniker P(?)NYB(? )Y, pronounced 'ponyboy', accidentally left in a post-interview segment recorded at the end. This was supposed to be edited out before it went online. This post-interview chat revealed a secret about the unsolved K4 section of Kryptos. The unedited version of the podcast was online only for a few hours before the mistake was noticed and the podcast was edited to remove the extra segment. I saved the original unedited podcast. This is a Tweleve exclusive, not available anywhere else on the Internet. Enjoy, and then let's discuss. She says she has been forthcoming. And if she was not forthcoming, it was only in an effort to gain trust in her informant and get more secrets. Should you believe her? Of course you should. In fact, that is my new motto. Trust everyone. Did the sarcasm come through ok? Hope so. Another Christmas gift from you uncle Rusty-Santa. Mr. Scheidt said it had taken only three or four months to devise a puzzle that has lasted nearly 16 years, adding that only he, Mr. Sanborn and "probably someone at C.I.A." know the answer. I read an interview somewhere where he was told (after claiming he knew the answer) that Sanborn had said he never gave him the whole thing. His remark was something along the lines of: Anything is possible. I'll post it when im done. Basically just a step or 2 backwards which is what I think needs to happen. Anyway - Thanks uncle rusty! You're the best! PS - Can I have a sip I wont tell mom! Let's kick this conspiracy theory up a notch. On April 19, 2006, Jim Sanborn contacted Elonka Dunin and gave her the biggest Kryptos news in years, the "LAYERTWO" K2 ending. This started a media frenzy of Kryptos stories and interviews. Two days later, Dan Brown's publisher released a statement that his next novel, The Solomon Key, would be delayed until 2007. (link: http://www.thebookstandard.com/books..._id=1002384181). 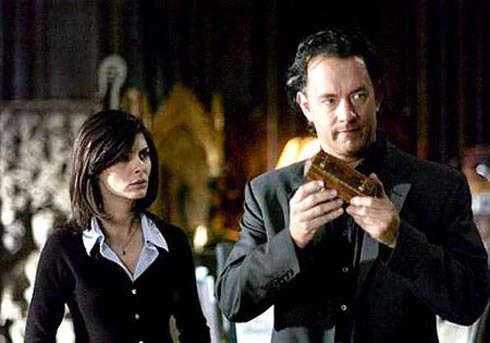 The Solomon Key is to involve the Kryptos statue, and it's involvement was confirmed with puzzles incorporated into The DaVinci Code's dust jacket. Since April and the most exciting breakthrough on Kryptos in years, Elonka, Kryptos maven extraordinaire, has been silent. She has stopped discussing Kryptos entirely. After the wave of media interviews subsided, there has been nothing. No posts from her at all on her own Yahoo group. Could it be there is a reason for this silence? She has admitted to being acquainted with both Sanborn and Dan Brown. In fact, she introduced Dan Brown to Sanborn. There maybe something going on in this happy little triangle of insider knowledge. The motive would be the treasure of the Solomon Key. This book is guaranteed to be a best seller, and Dan Brown must be worried that a Kryptos solution at this point would derail his golden gravy train. And yeah I hate to say it. But its pretty obvious Elonka is suceptible to the fame/cool bug. Not evil. I am a fan of Mr. Brown. I intend to buy and read his new book ASAP. In fact, if I were to suddenly crack the K4, I would try to contact Dan and find out if there was any danger of spoiling his book release by going public. And if there was, my silence could be bought. PS - im actually a "fan" too but normally am not fans of authors who ride the gravy train once they get there. The movie SUCKED. I just like the way he uses the word "the". Anyway--who cares about this junk anyway--dans just gonna write about how kryptos is a gateway to an ancient religion (mayan) and elonkas prolly trying to cash in. In fact, if I were to suddenly crack the K4, I would try to contact Dan and find out if there was any...way... my silence could be bought. This is approaching an area of my brain where i store pet peeves and the like. I understand my distaste is not neccisariy justified, but because its a pet peeve, i don't care!! the davinci code movie SUCKED!1 it wa sthe worst example of something cool getting bastardized since episode 1. Maybe db, stadther, marcus mucha and sanborn should play a doubles tennis match. so yeah--no point in trying to raise logical points to help me see it another way. its not often i can just bleh throw it out there. feels good.